Mechanical Engineering Professor Alan Nye, left, celebrates with Lynn Bishop ’93 (mechanical engineering) after unveiling the original car from the 1991-92 season. The car was driven by Bishop, project manager of the first team, at the Imagine RIT: Innovation and Creativity Festival. When Lynn Bishop and William Robinson proposed building RIT’s first Formula racecar in 1992, they had practical goals—design a sleek, uncomplicated car that could compete against the top collegiate race teams in the country. RIT Formula Racing would exceed expectations and be in the top 10 in each of its first five seasons—a feat only a handful of established teams would match. The team this year is celebrating its 25th anniversary of racing and providing hundreds of students over those years with automotive engineering skills, championship seasons, a pathway to careers and alumni network connections as intricate as a racecar engine. Bishop ’93 (mechanical engineering), vice president of engineering services at Pratt & Miller Engineering and Fabrication, grew up around racing, watching his father race at Watkins Glen, N.Y. During his first year at RIT, Bishop joined the RIT Baja off-road race team, and by 1991, started persuading friends like Robinson ’94 (mechanical engineering) to start a new team and build a racecar that would resemble professional Indy and Grand Prix vehicles. There was a core group of 10-15 students on that first team, and they did not want to just compete, they wanted to make an impact. “Our No. 1 consideration was simplicity and focusing on the basics, not going out there with a super new, untested innovation,” said Bishop. Keeping to the fundamentals, making the car lightweight with a low center of gravity, focusing on the overall car—not just the engine—proved to be a winning combination. RIT held its own against teams from the University of Michigan, Texas A&M and Cornell in its first competition at Chrysler Technology Center in Auburn Hills, Mich.
“After two years of planning, designing, building and testing, it was exciting to finally be in the paddock,” said Kristian Houghton ’95 (mechanical engineering). He’d drive in the acceleration event, help the team place 8th overall and be named Rookie Team of the Year. “It was incredibly exciting to see us compete so well, and so strongly. It far exceeded our expectations. We won a couple of design awards, so it was very satisfying to see the team do so well and be up there with the top schools,” Bishop added. Bishop and his teammates would also be recruited by the many companies that come to Society of Automotive Engineers (SAE) events seeking talented engineers on college design teams. He started working at Ford Motor Co. in its Advanced Vehicle Technology Division after graduation. 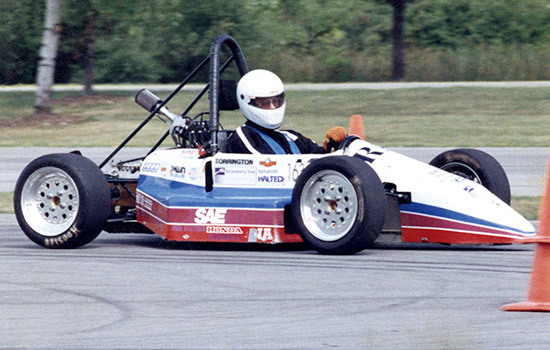 In 1998, he’d start his own firm, Aletheon Technologies, with Doug Louth, a Formula SAE alumnus who competed on the University of Michigan team. Four years later, their highly successful automotive engineering consulting firm would merge with Pratt & Miller, and he’d serve as race engineer on the Corvette America LeMans Series team and chief engineer of the Cadillac and Grand American Road Racing programs, all winning major championships. “I remember when I graduated, it was a pretty emotional time to leave the team. I told the guys that my dream would be to figure out how we could all work together in the future. It was an amazing group of people that had a common focus—competing, engineering excellence. That is what Doug and I wanted to create in our consulting company. It was kind of a Formula SAE graduate program,” Bishop said, laughing. Over the next years, other Formula members would come to the company as co-ops. Others, like Ryan Baldi ’09 (mechanical engineering) and Aleksey Kovtun ’12 (mechanical engineering), would be hired as design and simulation engineers and work on Indy and Corvette Racing championship teams. Kristian Houghton said that the relationships he developed at RIT had a huge influence on his life. Bishop has been his boss for eight years at Pratt & Miller and he met his wife of 18 years, Deana (Mallo) Houghton ’96 (mechanical engineering technology), in the machine shop at RIT. Since designing its first racecar in 1992, RIT Racing has been competing in national SAE design challenge events. When SAE began international competitions in 1998, RIT was one of the first U.S. teams to compete, entering contests in Germany, Austria, Australia and England, winning events in the latter two countries. By 2010, it was ranked fourth among 450 international teams in a new world ranking system. It wasn’t until 2009 that it would take the elusive top award overall at a competition in the U.S., and even its closest competitors were proud of the win after five straight years of second-place overall finishes. Nye has been the team’s academic adviser since it began, and he has been recognized as one of the best seven times by SAE. He also received its Excellence in Engineering Education Award in 2004. RIT remains one of the few teams that build custom systems such as the drivetrain, brakes and electronics rather than purchase off-the-shelf equipment. In looking at the different racecars over time, the team incorporated aerodynamic designs, new technologies and used high-tech systems to simulate car performance that benefitted them in competitions and later in the workplace. This year, the team fielded two cars in competition for the first time, one an electric vehicle. 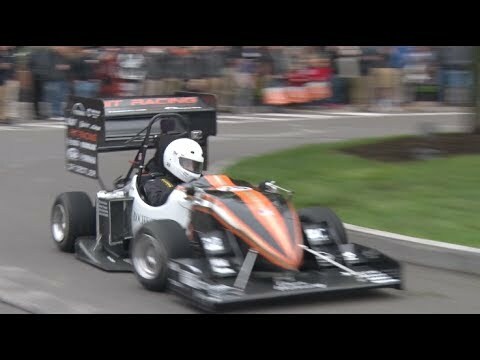 Both cars were unveiled at the 2017 Imagine RIT: Innovation and Creativity Festival and raced in competitions during the summer. 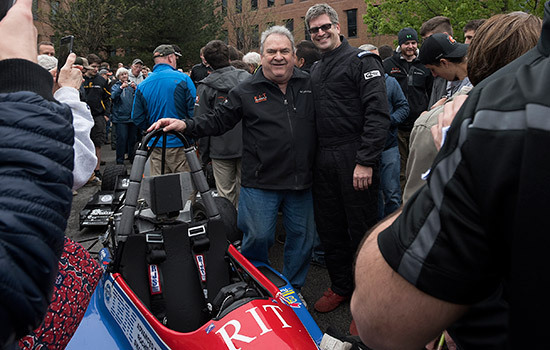 A third car unveiled at Imagine was F1, the first racecar built in 1992 and refurbished over the past year by RIT Formula alumnus and team leader Salvatore Fava ’16 (mechanical engineering). Bishop once again drove the car, but this time it was in front of current and past team members at the festival. Formula alumni over 25 years retained the work ethic established by Bishop and his teammates. Teams rarely ask that anymore. Did you participate in RIT Formula Racing? Contact us at umag@rit.edu to share your memories. Lynn Bishop drives the first Formula car, F1, at the team’s first major competition in 1993. The car was refurbished this year by Salvatore Fava ’16 (mechanical engineering) to celebrate 25 years of Formula Racing.